Though not on the best of terms with French journalist Roger Raffin, the father of his stepdaughter Kirsty’s son, Enzo Macleod makes a wager that he can solve the seven cold cases cited in Raffin’s new book, Assassins Cachés. The current one: In 1989, Lucie Martin disappeared, supposedly killed by Régis Blanc, a man she met through Réntree, an organization helping newly released prisoners resettle into society. Régis is currently serving a life sentence for other murders. In 2003, a skeleton is discovered at the bottom of a lake on the Martin property. It’s determined to be Lucie’s, and evidence shows the condition of the body was made to look as if she were killed in the same way as the women Régis confessed to murdering. Enzo finds that an understatement. There’s Lucie: young, innocent; Tavel, her fiancée, adamant that Lucie jilted him for Régis; letters from Régis, obviously written by a man who loved but not one who killed; and Lucie’s father, refusing to believe his daughter would have an affair with a criminal. When his daughter Sophie and her fiancé are abducted, the threat couldn’t be plainer. Enzo should cease investigations or he’ll never see either again. He heard her voice breaking. A stifled sob. ‘Don’t worry, baby. I’m going to get you out of this.’ Though he had no idea how. Risking his daughter’s safety, Enzo plows on, seeking the truth of Lucie’s death, discovering along the way that Raffin himself may be involved. When he finally faces the killer, he uncovers at the core of the mystery a truth that will break his own heart, even as a crisis in his family reveals another secret. While teetering perilously close to being a mystery noir, with similar elements and a convoluted plot twisting back upon itself in a maze of suspicion and accusation, author May’s main character isn’t a hard-boiled private eye by any means. Rather, he’s an offbeat, ponytailed, fiftyish forensics scientist, a bit out of his element in a foreign country where his skills are given a jaundiced eye by the police. Intertwining his somewhat complicated private life with that of his investigations, his backstory is left to inference, hints dropped here and there during the narrative. There’s no solid explanation identifying various people and how they relate to the main character. Rather it seems expected that anyone reading this particular novel will have enough knowledge of the others in the series to be already aware. Generally the investigator is a lone wolf, unencumbered by family, between or abandoned by lovers. Enzo’s harried home life and the somewhat tortuous relationships he has with various lovers and offspring make a refreshing contrast as does his dogged determination to solve the case. He’s perceptive and resourceful but a man with weaknesses; the discovery of the killer nearly brings to his knees. 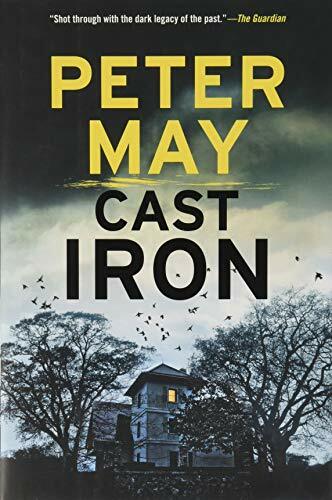 Peter May has written a suspenseful and detailed story with a plethora of suspects. This novel is noted as the last of the Enzo cases, but because of its ending, the reader may hope this isn’t so.